NAEYC and BAM Radio Network partnered to bring NAEYC Radio. The program was developed to bring the best and latest insights on early childhood education directly to parents and educators. 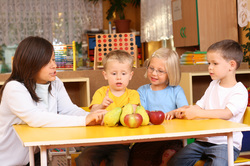 Looking for a job opportunity in the Early Childhood Field? Click below to see what's available. ﻿Up to date information for trainings, meetings and other ECED events in the community.